Badarina: this word summarizes the history of the Grimaldi family. This combination was born in the 30s of the 19th century with Nonna Clara (Bruna Grimaldi’s mother), born in 1939, who, together with her sisters, used to live in a farmhouse in a small village in the centre of Badarina. In 1947, her family moved to the red brick house built on the top of the ridge, where it still stands, to dominate Badarina. Today, it is the only house of the small village that still exists: in the 60s the Bersano family bought the land and planted it with vines. The vineyard was cultivated by hand, the soil was managed with the plough and the bull and the wheat was sown between the vines rows. Clara remembers that all the vines were hoed at least twice per year. And she also wants to emphasize that the purchase of the rototiller was a great progress, almost a revolution, the first transport with engine that was also used to travel to the centre of Serralunga. The grapes were vinified at home. Clara’s father used to sell the wine in tanks thanks to a broker: she remembers that whenever a deal was closed, it was a day of celebration and a good lunch was prepared for these gentlemens with tajarin and chicken being normally offered. Then, Clara married Giovanni Grimaldi and moved to Grinzane Cavour in 1959. Nowadays, instead of meadows and sown areas, the long hill of Badarina, is designed by 20 hectares of vineyards, where the historic Vigna Regnola, in the areas surrounding the farmhouse, and other small plots are found on the ridge that extends southwards. These were planted with Nebbiolo and also with Dolcetto and Barbera in the remaining plots. The history has changed but Badarina is still there, important and magnificent, and its Barolo is one of the most valued of Serralunga d’Alba. Badarina draws, to East, the southern extremity of the long hill of Serralunga d’Alba. The high altitude (350-450 mt above sea level) and the peculiar characteristics of the soil give an exceptional complexity to the wine and perfumes to the wine. These are characterized by roses, violets aromas which develop into balsamic and mentholated notes with development. 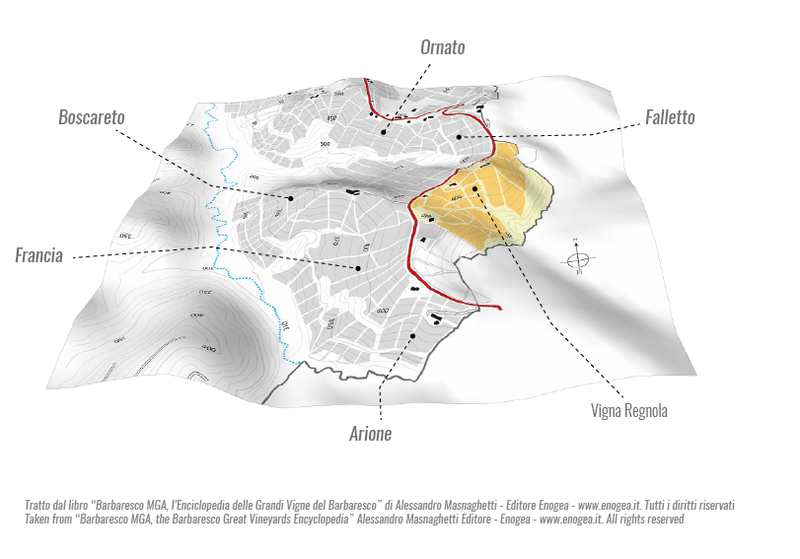 The soil belongs to Formazioni di Lequio and is one of the oldest in Langhe which mainly characterizes the municipality of Serralunga d’Alba, between those that belong to the Barolo area. The grapes have thick and crunchy skins which present a high level of tannins and colour and they are well suited to long traditional skin macerations. With their experience, Bruna and Franco have selected portions of the vineyard that are vinified separately and blended together only during the ageing process. This is a historic vineyard that was officially claimed in the Barolo classification map. It is the vineyard that has always been planted with Nebbiolo vines. It is located in the heart of Badarina cru, with a south-facing aspect. It is considered to be one of the most prestigious vineyard of Badarina in terms of altitude, perfect exposition and shallow soil with superficial marl rock. We produce Barolo Badarina Riserva from this vineyard. In the best vintages the grapes are selected during the harvest: on the top of the grapes from Vigna Regnola, other selected grapes are used. The cuvèe is vinified on its own following long submerged-cap macerations. The wine spends three years in oak and two years in bottle.